MANILA • The Philippines will station new fighter jets and two frigates at the former US naval facility in Subic Bay from early next year, officials said, the first time the massive installation will be functioning as a military base in 23 years. Using Subic Bay would allow the Philippine Air Force and Navy to respond more effectively to Chinese moves in the disputed South China Sea, security experts said. Subic Bay's deep-water harbour lies on the western side of the main Philippine island of Luzon, opposite the South China Sea. "The value of Subic as a military base was proven by the Americans. Chinese defence planners know that," said Mr Rommel Banlaoi, a Philippine security expert. Once one of the biggest US naval facilities in the world, Subic Bay was shut in 1992 after the Philippine Senate terminated a bases agreement with Washington at the end of the Cold War. Manila converted the facility, which was never home to the Philippine military, into an economic zone. Defence Undersecretary Pio Lorenzo Batino said the Philippine military signed an agreement in May with the zone's operator, the Subic Bay Metropolitan Authority, to use parts of the installation under a renewable 15-year lease. US warships have called regularly at Subic Bay since 2000, but only to dock during exercises with the Philippine military or for repairs and resupply. Officials said once Subic Bay was a military base again, the US Navy could have much greater access to it under a year-old agreement that gives US troops broad use of local military facilities, although that deal is on ice after it was challenged in the Philippine Supreme Court. Using Subic would be the latest Philippine military move to combat China's maritime ambitions. Besides beefing up security cooperation with the US, Japan and Vietnam, the military plans to spend US$20 billion (S$27.3 billion) over the next 13 years to modernise its armed forces. China, which claims nearly all of the South China Sea, said it was aware of reports of the arms buildup. "We hope that the Philippines does more to benefit regional peace and stability," China's Defence Ministry said in a statement. Two FA-50 light attack fighters made by Korea Aerospace Industries, the first among a dozen ordered last year, would be based at the former Cubi Naval Station in Subic Bay from early next year, two Philippine generals said. Two naval frigates would be stationed at Subic Bay's Alava Port. Security experts noted that Subic Bay is only 270km from Scarborough Shoal, which China seized from Manila in 2012 after a three-month stand-off with the Philippine Navy. The disputed Spratly islands, where China is building seven man-made islands, some with military facilities, lie further to the south-west of the shoal. 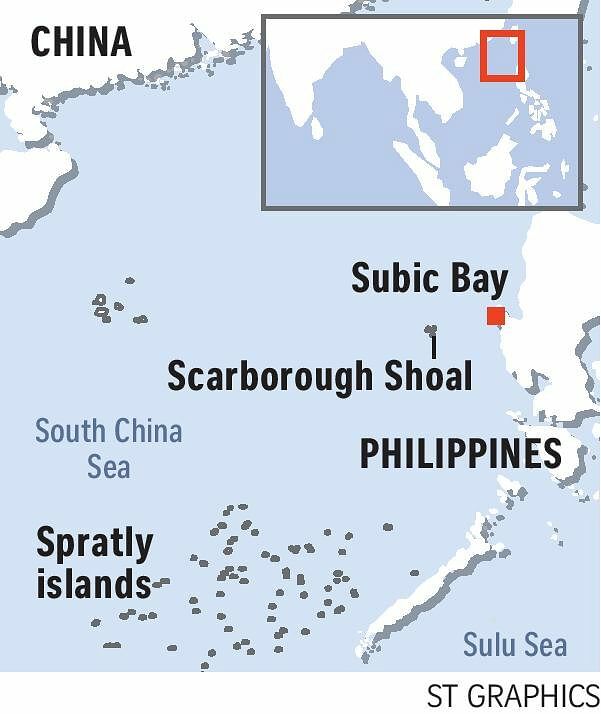 China might also turn Scarborough Shoal into an artificial island, which could make it harder for the Philippines to protect its 370km exclusive economic zone off Luzon, said Dr Patrick Cronin, a regional expert at the Centre for A New American Security in Washington. "New Korean-built light fighter aircraft could reach Scarborough Shoal in just minutes, and maritime patrol aircraft or drones could eventually provide persistent coverage of Chinese movements in the area," Dr Cronin said. "A return to Subic Bay, this time led by the Philippine Air Force, would seem to be a prudent defensive response."